Recipe by Annie Copps of The Daily Dish. 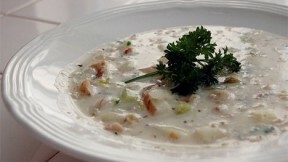 This recipe includes all the traditional ingredients of true New England clam chowder: It's rich and thick without being glunky because we've all had that bad bowl of glue. In a large soup pot over high heat, add clams to 3 cups water. Bring to a boil and cook just until clams open, about 10 minutes. Remove clams from broth and set aside. (Discard any clams that don't open.) Strain broth through a sieve lined with a coffee filter and set aside. Clean your soup pot; then over medium-high heat, sauté bacon until it's browned and fat is rendered. Using a slotted spoon, remove bacon to a paper towel. Discard all but 2 tablespoons of bacon fat. Add diced onion to the pot and sautê until translucent. Stir in flour and cook 1 minute, being careful not to brown. Whisk in reserved clam broth. Add potatoes and thyme, and simmer 10 minutes. Remove clams from shells, reserving liquid, and chop roughly. Strain liquid; then add clams and liquid to the pot. Stir in parsley and cream and cook just long enough to heat clams through, about 3 minutes.